A duke who needs to be tamed...a lady who refuses to be rescued. "Emotionally charged and powerful...a well written and well rounded story of redemption." "Wow, finally, finally, finally, a regency heroine I can wholeheartedly get behind!" "One of the most likeable heroines I have ever come across. Adam...hero crush. Their chemistry was amazing." "This book was exceptional. A brilliant story of redemption, love and passion." "The characters that Gayle creates are so freaking lovable, it hurts. 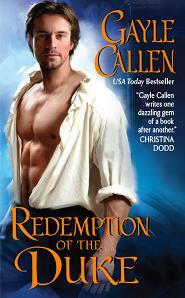 Redemption of the Duke was beautifully written." "A charming tale of honor and redemption...the characters are beautifully drawn." Adam caught a glimpse of Faith from behind, disappearing into the gloom of a Roman temple. Though he ducked behind a tree and watched to see if someone approached, no one seemed to be following, and the lamps didn’t extend down this path. He turned and followed her up the faux-marble stairs. She gave a gasp and whirled around, the sequined mask pressed hard to her face as if for protection. The satin of her gown glistened by distant light, and suddenly she looked like the fairy in their supper box painting, distant, ethereal, lovely. “Faith, it’s me.” He lowered his mask. Her voice was growing more fearful, her tone higher in panic. And then she fell into his arms. It was what he’d dreamed of on sleepless nights, holding her, feeling the press of her breasts to his chest, the flare of her hips in his hands. He forgot all about where they were, why they were alone together. He forgot the risk of his dishonor and her ruin. There was still a corrupt beast inside him, waiting for this chance. All that mattered was that they were alone, and she was with him, and he wished he never had to let her go. Wasn’t this how people felt when they wanted to marry? Now that was a shocking thought, but he couldn’t be surprised. She lifted her head and looked up at him, and the faint moonlight or a distant globe just touched her face, made the sheen of her eyes seem to glow, glistened on her parted lips. Faith had thought the duke’s appearance out of the darkness was startling, but nothing surprised her more than looking into his eyes, gleaming out of the dark shadows of his face, and realizing she’d thrown herself against him, so boldly wanton without even questioning it. Her behavior had the usual male response—he leaned down, blotting out the world beyond, even her very conscience, and kissed her. And suddenly she wasn’t Miss Cooper, spinster lady’s companion, anymore. She knew what to do to excite passion, how best to increase her own pleasure. She didn’t think, or she would have been lost in recrimination and regret. She simply existed, here in Adam’s arms, languid with the knowledge of sensual pleasure. When he kissed her gently, it wasn’t enough to combat the urgent need that had been building inside her. She’d been dreaming of him, even that simple touch on her cheek, imagining his hands on her body, him filling her. She opened her mouth, boldly suckling on his lip, burning for him. At last his tongue swept into her mouth and she met it with her own, dueled and rasped and tasted. She clutched his shoulders, pressed herself hard against him. “Faith,” he said against her mouth. Her hands roamed his shoulders and arms, feeling the muscles of a man who’d done more these last six years than frequent gambling dens or ballrooms. She gasped when he broke their kiss and pressed his mouth to her forehead, her cheek, her jaw. She arched backward, letting him sweep aside the shawl from her shoulders, revealing the gown’s bodice she’d been hiding. It showed too much, and though she’d regretted it earlier in the evening, such concerns were long gone. She moaned as he traced his open mouth down her neck, licked at the hollow in her throat, traced a path to the valley between her breasts. Barely able to think, she was caught in a haze of heat and passion and desperation. She felt … lost, overcome—and suddenly very frightened. It was as if another woman had emerged from inside her, and all along she’d barely been held back. Faith broke away from the kiss, unable to catch her breath, Adam watching her. “Your Grace, I—I—” What could she say, how could she explain what kind of woman she was, without risking her position, her livelihood, her very soul, if she didn’t stop herself from wanting what she should not have? “That kiss—” he began, then his words faded as he stared at her mouth. She realized his breathing was labored, too, that he was just as affected. But what did that matter? He was a man, and could do as he wished. And now he knew what kind of woman she was, that she was sinful, that she was no innocent.